When Ideal-tek introduced the Ergo-tek range in 2013, we set a new benchmark for the ergonomics, quality, ESD and beauty of high precision cutters and pliers. Customers love this product line. 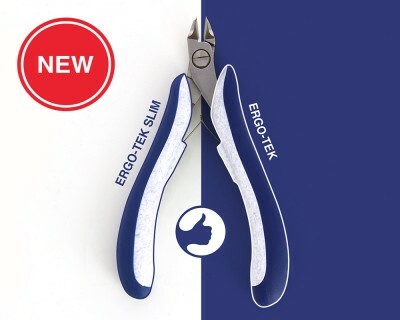 ERGO-TEK SLIM is the new generation of high precision cutters and pliers. The new lighter weight Ergo-tek Slim range from Ideal-tek is designed especially for smaller hands while providing the same ergonomic, ESD, and technical advantages you expect from Ideal-tek. Details of the whole Ergo-tek slim range are available in the Ergo-tek Slim leaflet and on our website. With Ergo-tek AND Ergo-tek slim, users are now able to custom fit high precision tools to their personal preference and application. No more, one line fits all! The Ergo-tek line from Ideal-tek represents the perfect combination of ultra high quality, durability, and ergonomics.